Secure Cloud Communications for demanding enterprises utilizing the very latest in VoIP/SIP technology for voice, video and data communications via a one cable infrastructure. Enable instant messaging, desktop sharing and multi-point voice, data and/or video conferencing for your co-workers. Voice messages can be accessed online, replayed over the phone, or forwarded to your email. Get presence information from your co-workers with full calendar integration. Never miss a call with an extension number which follows you wherever you are. Enable instant messaging for your co-workers from any device. Keep organised with built-in contacts directory. Easily call back your missed calls or redial frequently used numbers. 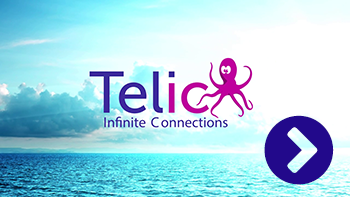 Telic Infinite Connections is a cloud-based business phone system created especially for organizations that require professional communication features without having to own and manage an onsite telephone system. Site-to-site calls are free and unlimited. Enable your co-workers to talk to each other for free, whether they are in the next room, building, city or on the other side of the world. Register multiple end-points per user. You can use it simultaneously on your computer, desk phone and mobile app and be reachable wherever you are. Because we route your calls over the Internet the cost is typically much lower compared to traditional telecommunication operators. Queues allow you to automatically distribute phone calls to a specific group of agents within your VoIP telephone system.